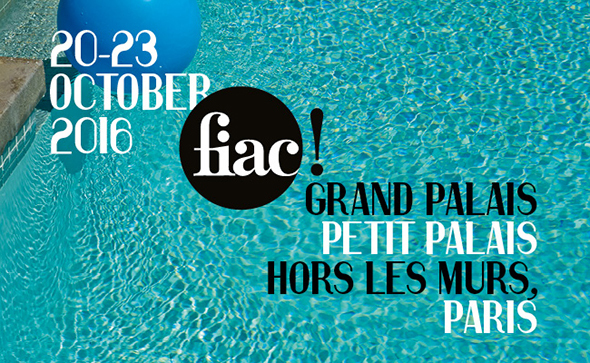 The 43rd FIAC, one of the world’s leading art fairs, will be held in Paris from Thursday, October 20 to Sunday, October 23, 2016, in the historical Parisian venue, the Grand Palais. The vernissage will take place on Wednesday, October 19. The fair will present 186 of the world’s most prestigious galleries from 27 countries. Directed by Jennifer Flay since 2010, the fair is broadening the scope of its programme this year. FIAC’s new sector, On Site, will present sculptures and installations in the prestigious context of the Petit Palais, directly opposite the Grand Palais in association with Christophe Leribault, curator and director of the Petit Palais, and associate curator Lorenzo Benedetti. On Site will assemble nearly 40 artworks that invest the spaces of the Galerie Sud, the Pavillon Sud, the Galerie Nord, the Garden of the Petit Palais, the Galerie des Grands Formats. As part of On Site, FIAC settles on the Avenue Winston Churchill between the Petit and Grand Palais for the duration of the fair. A unique moment in the history of art events in Paris. As an extension of the exhibition the Tuileries Garden, the musée Eugène Delacroix will open its doors to FIAC visitors, in association with the musée du Louvre. Stéphane Thidet will present two major works. Our “In Paris during FIAC” programme presents a network of over 100 cultural institutions, including prominent museums, arts centers, private foundations and collections such as the Louvre Museum, the Centre Pompidou, the Palais de Tokyo, the Musée Picasso, the Fondation Louis Vuitton, the Grand Palais, the Musée d’Art moderne de la Ville de Paris, the Château de Versailles, the Musée des Arts Décoratifs, and the Petit Palais.